Mission Santa Bárbara. Courtesy of Santa Barbara Mission Archive-Library. Founded on December 4th, 1786 by Father Lasuén and named after Saint Barbara, Mission Santa Bárbara is known as “The Queen of the Missions”. Originally scheduled to open four years earlier by Father Serra, disagreements between the church and state on how the mission should operate delayed the grand opening until after Searra’s death. 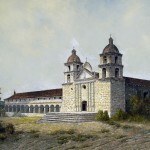 Mission Santa Bárbara began full operation a short time after its nearby presidio, which housed the soldiers and served as one of four military fortresses in California. With striking views of the Pacific, Mission Santa Bárbara truly compliments the adjoining beachfront community. Its location, centrally between the missions of the north and south, and accessibility by sea, set the stage for Santa Barbara to play a key role in the ultimate development of California, and later would become headquarters of all the missions. Santa Barbara housed the first California bishop, Francisco Garcia Diego y Moreno, who was installed in 1842. As a result, Mission Santa Bárbara enjoyed the status of a pro cathedral church. Garcia Diego is buried in the mission sanctuary of the church, along with four thousand Chumash Indians. Also in the cemetery are mausoleums, or burial tombs of Santa Barbara’s early Spanish families. Mission Santa Bárbara, along with Mission San Luis Rey, is one of only two missions continuously operated by the Franciscans since its founding. Originally the mission was for the Indians while the soldiers and their families went to the presidio church in downtown Santa Barbara. After 1850, Mission Santa Bárbara became more of a center of worship for the people of Santa Barbara. Following the devastation of several original adobe structures by earthquakes, the church at Mission Santa Bárbara was rebuilt of stone between 1812 and 1820, and restored again after the earthquake of 1925. The statues above the altar were brought to Santa Barbara from Mexico. Outside the church are the unique twin towers of Mission Santa Bárbara. Originally built with one tower, the second tower was added in 1831. Six bells hang within the church towers, each one dedicated to a saint and bearing the inscription of the cross. This elaborate façade often serves as a colorful background for community events, as it did in the early mission days. From US-101 : Exit and proceed east on Mission Street. Turn left onto Laguna Street and left onto East Los Olivos Street. 9am - 4:30pm daily; closed Easter, Thanksgiving, and Christmas.